This sci-fi book is now available on Kindle as part of the collection, 'The Lodestone Trilogy: Box Set' - a bargain priced 360,000-word epic! Save money and buy the first half of the series now. "As a skinflint it takes something good to get my money. This one is free, the other five are not. If you don't want to spend any money don't read this one because you will be forced back to Amazon to get the others. You have been warned." From the mind of indie sci-fi author Mark Whiteway - who brought you other sci-fi books such as 'The Arc of the Universe' - comes the first book of six within the critically acclaimed sci-fi collection, the 'Lodestone Series'. Blending fascinating world-building with a strong character-driven storyline, this book sits amongst modern sci-fi classics, and true fans looking for a sci-fi book for adults will not be disappointed. With hundreds of verified reviews on Amazon heaping praise upon indie author Whiteway's literary style, this is one sci fi book you don't want to miss out on. On the planet Kelanni, life is cheap. With the aid of the fearsome "Keltar" enforcers in their flying cloaks, a ruthless invader is forcing the native population to mine the colloquially named "lodestone" - a substance from another universe with infinitely destructive power. Pursued by Keltar, the party will encounter bizarre creatures, ancient technologies and terrifying dangers. 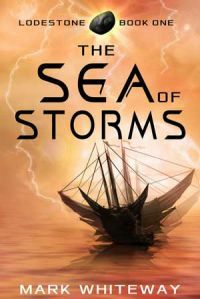 Finally, they must seek to cross a massive storm barrier in order to reach the other side of their world, where a world-shaking revelation awaits. It was awhile ago that I read this book so I can't give it a comprehensive review like I usually do. I will tell you that I remember that the characters were interesting with a guy that could fly with the use of magical/science-based loadstones and a woman and a young girl who were unlikely teammates. They meet and you learn some about their backgrounds in this story based in a world of different and yet similar creatures to what we have on Earth. At the end of the book the group makes it to the sea. This is the first book in a promising series and very much worth a read by SciFI and Fantasy readers and you can read it free so there is no risk. I give it five out of five stars.